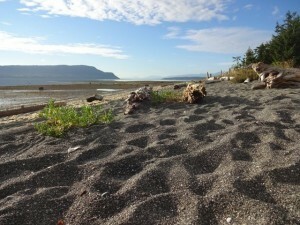 Sitting on the beach at Fillongley Provincial Park on Denman Island, I can hear waves crashing over a rocky beach. Hornby Island, on the other side of Lambert Channel looks close enough to swim to, and I wouldn’t doubt a few people have tried. 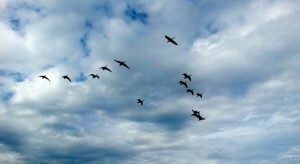 With a Canadian Flag waving from a beach-front home a few meters away and Canada Geese flying low and loud along the coast, I feel iconically Canadian; this is a far cry from “glamping”. There are only 10 campsites at Fillongley Park; five on the beach and five against the woods. Eight of them are reservable but the site is often full. There are no hookups, no flushing toilets and only one, cold-water tap. The 23 hectares that make up Fillongley Park were gifted to the Province of British Columbia by George Beadnell on January 17th, 1953. 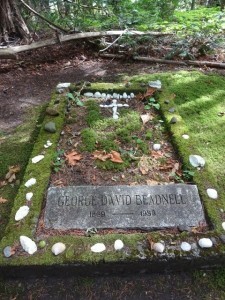 Mr. Beadnell died five years later and his grave is still clearly marked and can be seen along one of the meandering trails the follow a salmon bearing stream. The trails open up to what was once a lawn bowling green. There’s a mystical aura here now and the big trees seem to whisper of a by-gone era. Our kids play for hours in these trees, multiple branches shape-shifting into imaginary mansions with room enough for twenty. Time flies when there’s nothing to do; beach-combing, taking leisurely strolls through the old growth forest and watching the coastlines change with an invisible clock. There is a Saturday market on Denman during the summer months. It’s small but it’s friendly and pure and it’s a great place to get a good cup of coffee, which after two days of tent camping is was greatly appreciated. The market shares a site with the Denman Recycling Depot and a Free Store that volunteers keep running efficiently. It seemed like the whole community was here, even in the rain. If you’re on Denman, you might as well take the ferry to Hornby, if you didn’t swim across the channel. There’s a fabulous Free Store there, a lively and colourful market at the centre of town and Tribune Bay is a must – a piece of paradise on the one of the “jewels of the Gulf Islands”. 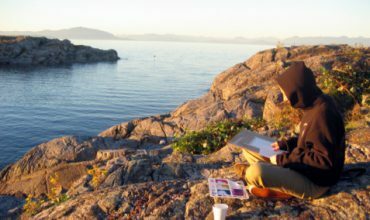 We spent four days camping on Denman Island and while we were only two hours from home, we felt a world away from the hustle and bustle of modern day life. There’s a small general store, one gas pump, no school and a whole lot of earthy, artistic living and free-spirited energy. To get to Denman Island, take BC Ferries from Buckley Bay, about 30 minutes north of Qualicum Beach on Vancouver Island. 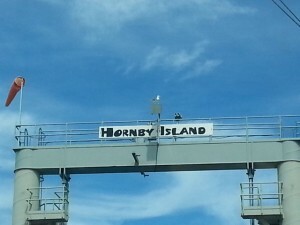 You can purchase thru-fare to continue onto Hornby Island.